The Flatbike Change Bike 611 is not our first folding bike with 26-inch wheels but it stands out of the crowd with some special features. 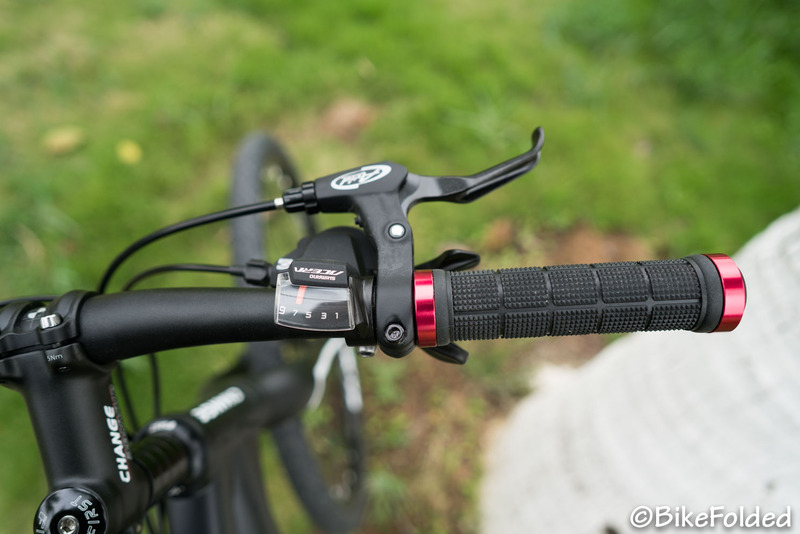 We’ve tested the bike for over 2 months and here is the full review. The Change Bike 611 is a hybrid bike which combines a road bike and a mountain bike. 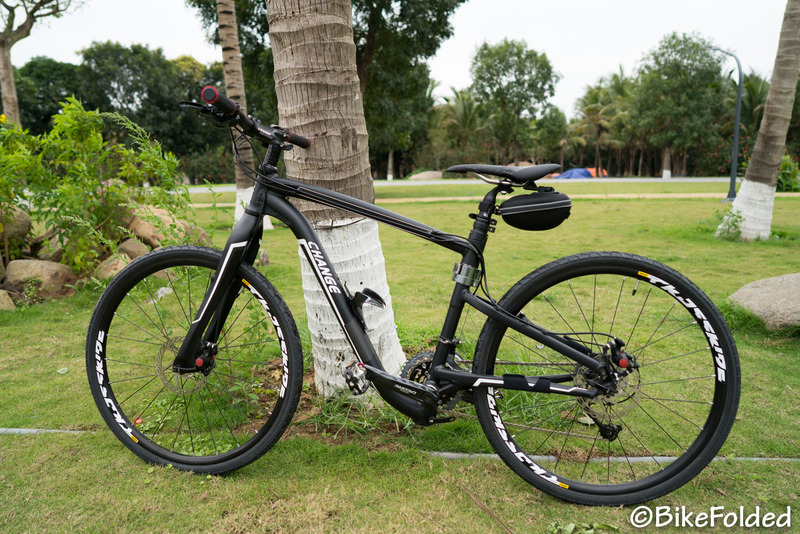 It utilizes advantages of each type to help us ride on all terrains and surfaces comfortably. The bike has a flat handlebar and a short top tube. 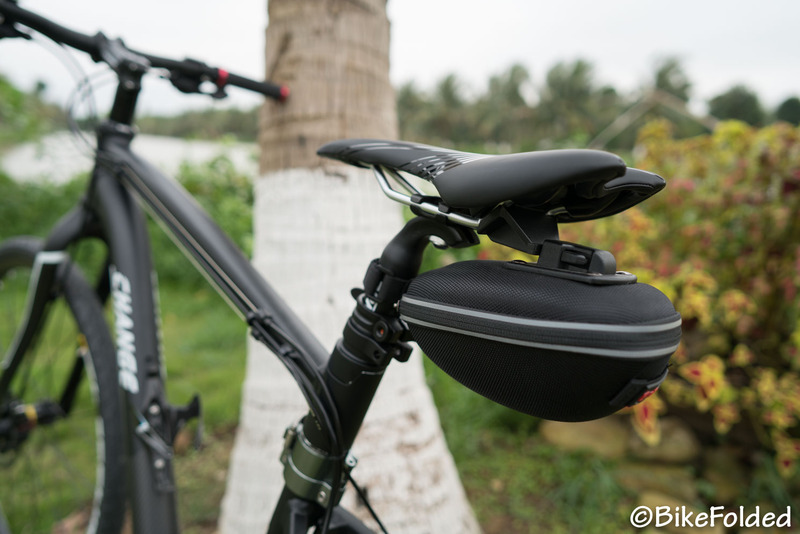 Besides, the top tube is sloped downwards from the head, therefore, it provides a relaxed riding position as we can sit with a fairly straight back. The more upright riding position reduce strains on our neck and shoulders. 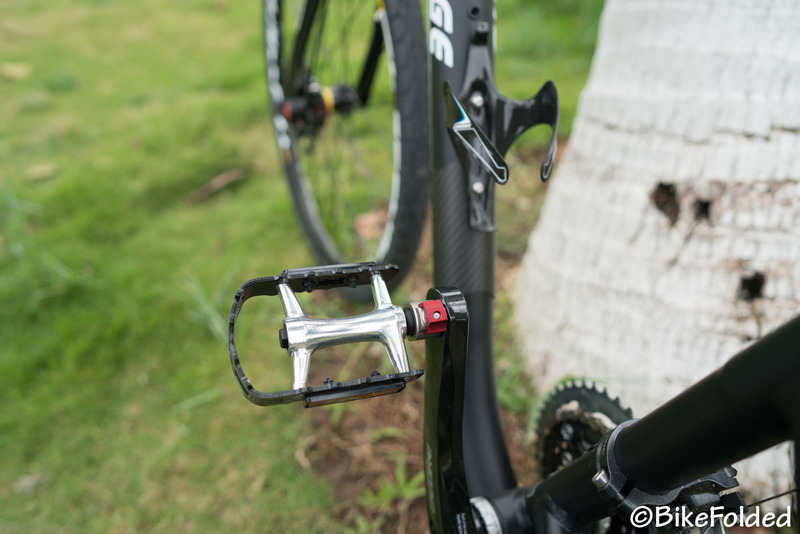 In terms of design, the DF-611MB looks a little different as compared to hybrid bikes on the market as it has a nice curve on the down tube. And more importantly, the bike is foldable. 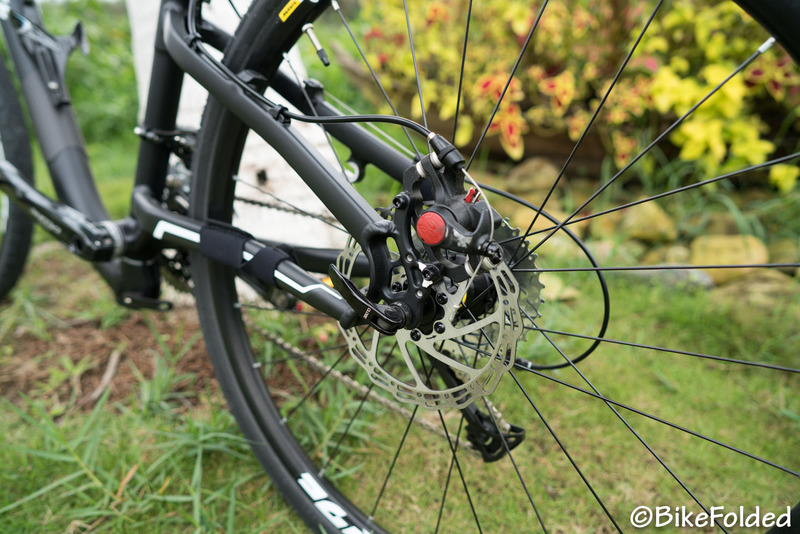 After removing the front wheel with a quick-release skewer, you can open some latches and fold the bike in half. The folded size is still cumbersome and it is almost impossible to carry it on public transportation. Even though the bike comes with a carrying bag, I hardly use it because of its size. 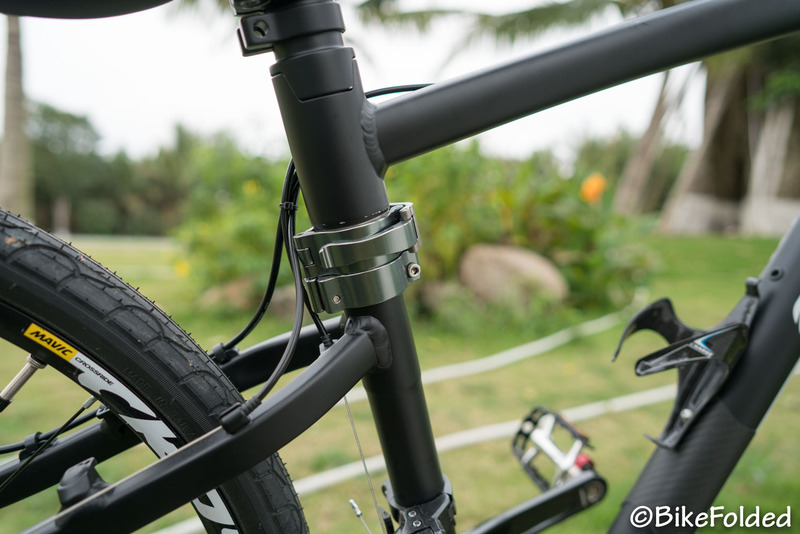 Despite being a full-size bike, the Change Bike is fairly lightweight at just over 26 lbs, this is the result of using light materials like aluminum frame or carbon fork. Moreover, the whole bike can fit easily inside a sedan’s trunk, so you can still travel with it. If you want to travel overseas with this bike, make sure to keep its packaging box for easy transportation. The box measures 35″ x 30″ x 15″. 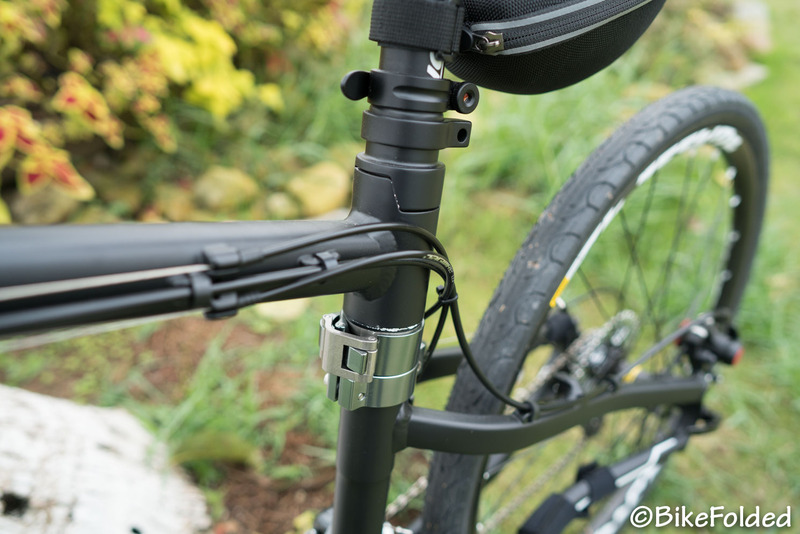 In terms of performance, the Change Bike 611 has little competition in the world of folding bikes. 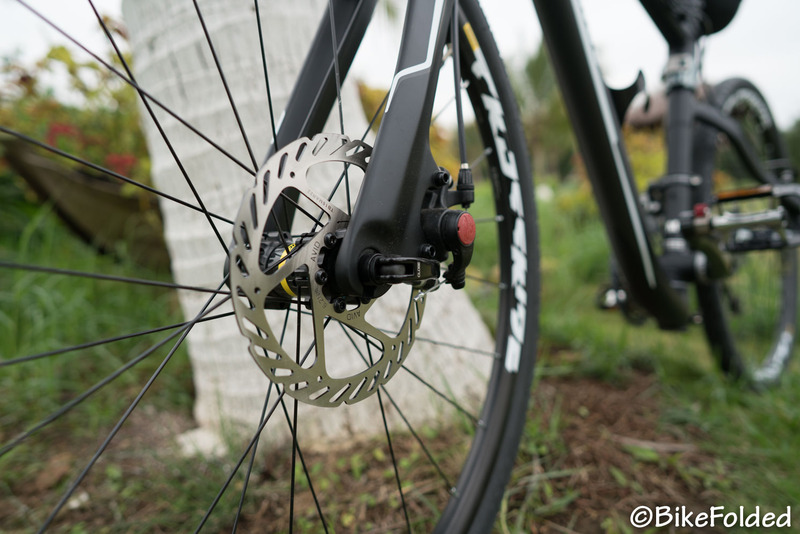 With a wide gear range and high quality derailleurs, it helps me climb hills with less pedaling efforts and ride faster. 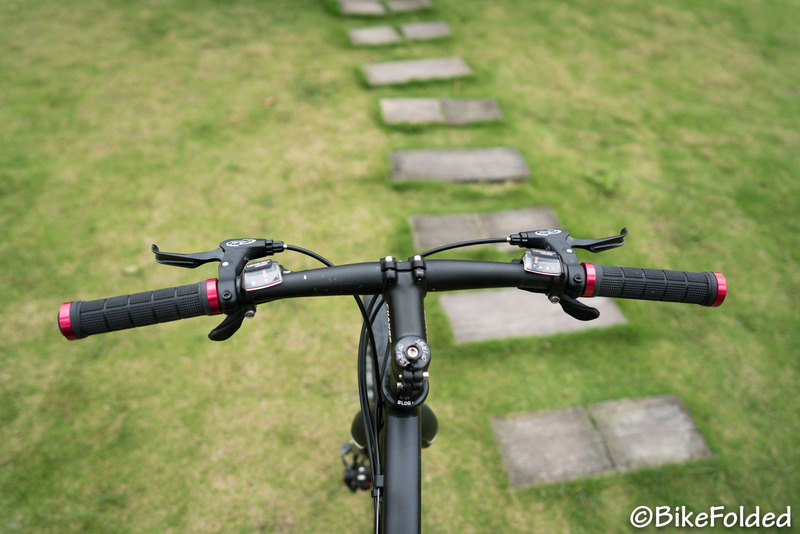 As compared to other full-size folding bikes like Oyama CX-9 or Dahon Espresso, the Change Bike’s speed is significantly higher. 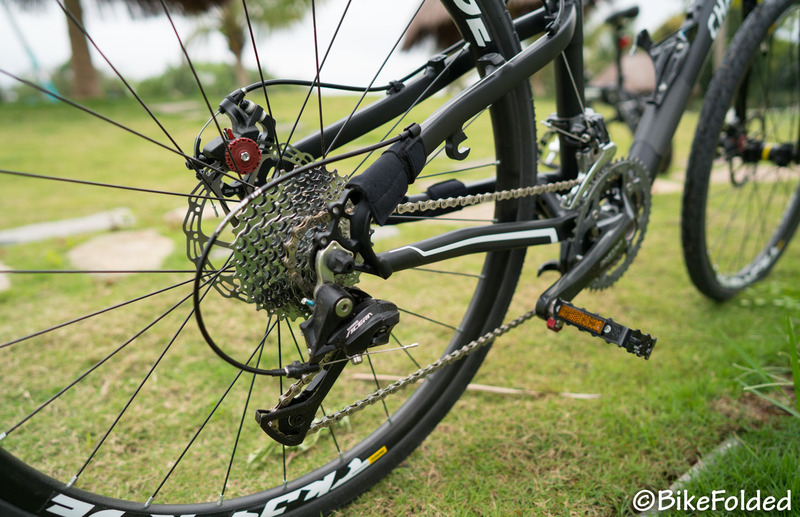 It uses Sram Avid BB5 disc brakes which provide quicker stopping and consistent performance on both dry and wet roads. I find that the bike finds the right balance between road and mountain bikes. It can deal with uneven off-road terrain and still deliver speedy rides on tarmac. 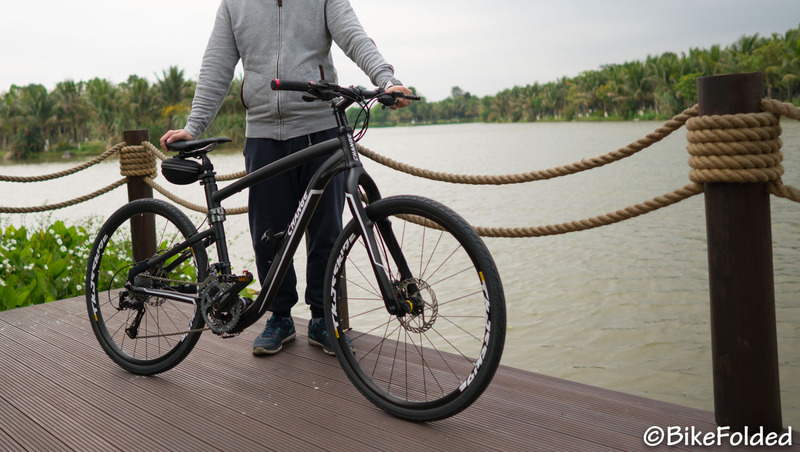 It is a rugged bike that passes the rigorous EN 14766 certification for mountain bikes, so it can even handle curb jumps, speed bumps or potholes. 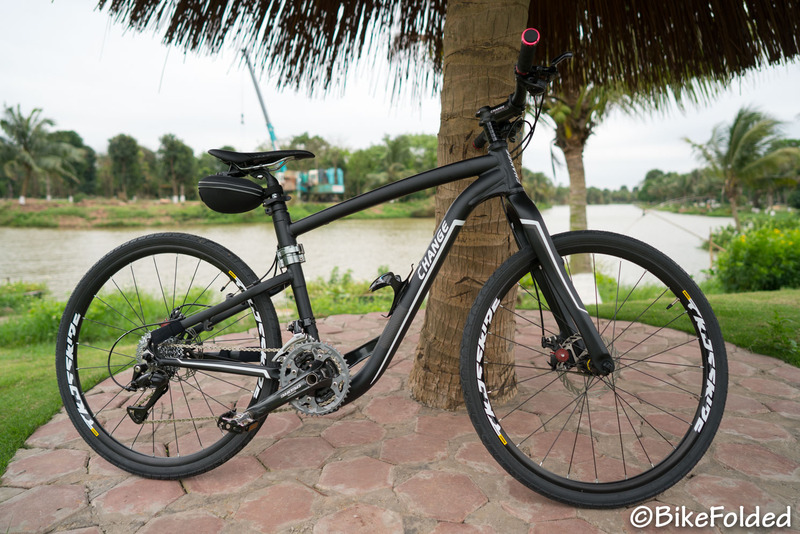 Besides, this is more like a road-orientated hybrid bike, so there is no suspension and the tires are not really fat ones; As a result, you can climb hills effortlessly, ride faster and keep up with traffic with ease. Overall, the Flatbike Change Bike 611 is a versatile and easy-riding bike that you can use anywhere. I use it to run errands around town or put it in my car to go to my favorite bike paths. 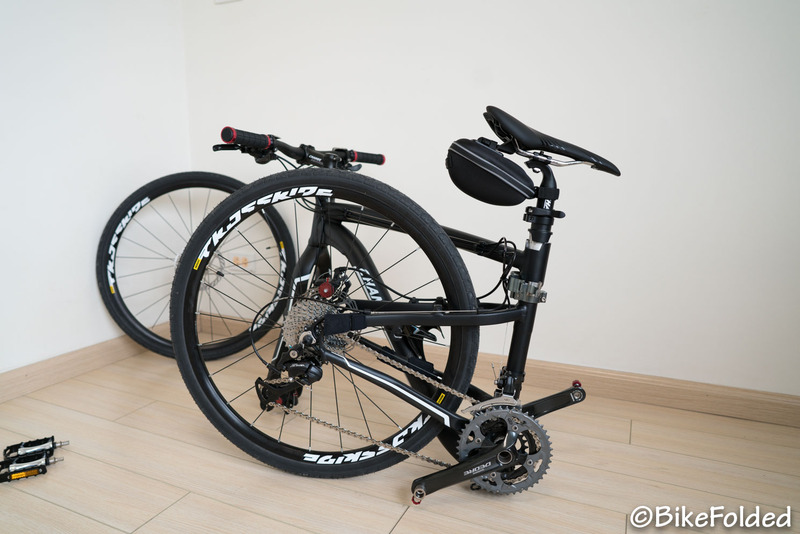 It is a little inconvenient during the folding and unfolding process but after all, we have a much higher performing bicycle. We at BikeFolded totally recommend the bike. A high-quality folding hybrid bike that can deal with gravel and potholes very well.